Georgetown is the third oldest city in the U.S. state of South Carolina and the county seat of Georgetown County, in the Lowcountry. As of the 2010 census it had a population of 9,163. Located on Winyah Bay at the confluence of the Black, Great Pee Dee, Waccamaw, and Sampit rivers, Georgetown is the second largest seaport in South Carolina, handling over 960,000 tons of materials a year. Georgetown was the commercial center of an indigo- and rice-producing area. It is the birthplace of former First Lady Michelle Obama's grandfather, Fraser Robinson. Many of Michelle Obama's Robinson relatives still reside in Georgetown. According to the United States Census Bureau, the city has a total area of 7.5 square miles (19.5 km2), of which 6.9 square miles (17.9 km2) are land and 0.62 square miles (1.6 km2), or 8.06%, is water. Winyah Bay formed from a submergent or drowned coastline. The original rivers had a lower baseline, but either the ocean rose or the land sank, flooding the river valleys and making a good location for a harbor. U.S. Routes 17, 17A, 521, and 701 meet in the center of Georgetown. US 17 leads southwest 60 miles (97 km) to Charleston and northeast 34 miles (55 km) to Myrtle Beach, US 701 leads north 36 miles (58 km) to Conway, US 521 leads northwest 82 miles (132 km) to Sumter, and US 17A leads west 32 miles (51 km) to Jamestown. As of the census of 2010, there were 9,163 people in Georgetown, an increase of 2.4 percent over the 2000 population of 8,950. In 2000, there were 3,411 households, and 2,305 families residing in the city. The population density was 1,368.1 people per square mile (528.4/km²). There were 3,856 housing units at an average density of 589.4 per square mile (227.6/km²). The racial makeup of the city was 57.03% African American (56.7 percent in 2010), 40.99% White (37.8 percent in 2010), 0.12% Native American, 0.31% Asian, 0.04% Pacific Islander, 0.84% from other races, and 0.66% from two or more races. Hispanic or Latino of any race were 1.88% of the population. There were 3,411 households out of which 32.8% had children under the age of 18 living with them, 38.0% were married couples living together, 25.1% had a female householder with no husband present, and 32.4% were non-families. 28.9% of all households were made up of individuals and 12.9% had someone living alone who was 65 years of age or older. The average household size was 2.55 and the average family size was 3.14. In the city, the population was spread out with 28.6% under the age of 18, 8.8% from 18 to 24, 25.2% from 25 to 44, 21.0% from 45 to 64, and 16.4% who were 65 years of age or older. The median age was 35 years. For every 100 females, there were 81.9 males. For every 100 females age 18 and over, there were 75.1 males. The median income for a household in the city was $29,424, and the median income for a family was $34,747. Males had a median income of $27,545 versus $19,000 for females. The per capita income for the city was $14,568. About 19.9% of families and 24.1% of the population were below the poverty line, including 34.9% of those under age 18 and 16.9% of those age 65 or over. Most of the older neighborhoods have Southern live oaks overarching the streets, such as these on East Bay Street. In 1526 a Spanish expedition under Lucas Vázquez de Ayllón founded a colony on Waccamaw Neck called San Miguel de Guadalupe. The settlers included enslaved Africans, and was the first European settlement in North America with African slaves. The colony failed for multiple reasons including a fever epidemic and a revolt of the slaves, who escaped to join the indigenous Cofitachiqui Indians in the area. Having failed as farmers, the surviving Spanish built a ship from local cypress and oak trees and sailed to the Spice Islands in Maritime Southeast Asia. The next settlement in the area was by English colonists. After settling Charles Town in 1670, the English established trade with regional Indian tribes. Trading posts in the outlying areas quickly developed as settlements. By 1721 the colonial government granted the English residents' petition to found a new parish, Prince George, Winyah, on the Black River. In 1734, Prince George, Winyah was divided; and the newly created Prince Frederick Parish congregation occupied the church at Black River. Prince George Parish, Winyah encompassed the new town of Georgetown that was developing on the Sampit River. In 1729, Elisha Screven laid the plan for Georgetown and developed the city in a four-by-eight block grid. The original grid city is listed as a historic district on the National Register of Historic Places. It bears the original street names, lot numbers, and has many original homes. The Indian trade declined soon after Georgetown was established. Planters established large plantations and cultivated indigo as the cash commodity crop, with rice as a secondary crop. Both were labor-intensive and dependent on slave labor, primarily workers imported from Africa in the Atlantic slave trade. Agricultural profits were so great between 1735 and 1775 that in 1757 the Winyah Indigo Society, whose members paid dues in indigo, opened and maintained the first public school for white children between Charles Town and Wilmington. Rice became the chief commodity crop by the early 19th century, and a staple of regional diets as well. In the American Revolution, the father and son Georgetown planters, Thomas Lynch Sr. and Thomas Lynch Jr., signed the Declaration of Independence. During the final years of the conflict, Georgetown was the important port for supplying General Nathanael Greene's army. Francis Marion (the "Swamp Fox") led many guerrilla actions in the vicinity. Following the American Revolution, rice surpassed indigo as the staple crop. It was cultivated in the swampy lowlands along the rivers, where enslaved labor built large earthworks: dams, gates and canals to irrigate and drain the rice fields during cultivation. Large rice plantations were established around Georgetown along its five rivers. Planters often had chosen to import slaves from rice-growing regions of West Africa, as they knew the technology for cultivation and processing. By 1840, the Georgetown District (later County) produced nearly one-half of the total rice crop of the United States. It became the largest rice-exporting port in the world. Wealth from the rice created an elite European-American planter class; they built stately plantation manor houses, bought elegant furniture, and extended generous hospitality to others of their class. Their relatively leisured lifestyle for a select few, built on the labor of thousands of slaves, lasted until 1860. The profits from Georgetown's rice trade buoyed the economy also of nearby Charleston, where a thriving mercantile economy developed. The profits from rice meant that planters bought products from Charleston artisans: fine furniture, jewelry, and silver, to satisfy their refined tastes. Joshua John Ward, who owned the most slaves in the US – eventually more than 1,000 slaves on several plantations, lived in Georgetown. 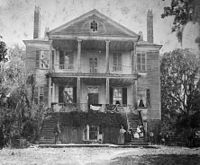 Many of the historic plantation houses are still standing today, including Mansfield Plantation on the banks of the Black River. Joshua Ward's main Brookgreen Plantation is the center and namesake of the Brookgreen Gardens park. Since the late 20th century, historic societies and independent plantations have worked to present more of the entire plantation world, including the lives and skills of enslaved African Americans. Georgetown's thriving economy long attracted settlers from elsewhere, including numerous planters and shipowners who migrated from Virginia. These included the Shackelford family, whose migrant ancestor John Shackelford moved to Georgetown in the eighteenth century after serving in the Virginia forces of the Continental Army. His descendants became prominent planters, lawyers, judges and Georgetown and Charleston businessmen. Georgetown and Georgetown County suffered terribly during the Reconstruction Era because of its continued reliance on agriculture, for which the national market was low. In addition, the rice crops of 1866–88 were failures due to lack of capital, which prevented adequate preparation for new crops; inclement weather; and the planters' struggle to find laborers. Some freedmen left the area in an effort to reunite families separated by the domestic slave trade. Many families withdrew women and children from working as field laborers. Many freedmen families wanted to work for themselves as subsistence farmers, rather than work in gangs for major planters. Rice continued to be grown commercially until about 1910, but the market had changed. It was never as important economically or as profitable a crop as before 1860. By the time the Reconstruction period ended, the area's economy was shifting to harvesting and processing wood products. By 1900 several lumber mills were operating on the Sampit River. The largest was the Atlantic Coast Lumber Company; its mill in Georgetown was the largest lumber mill on the East Coast at the time. In 2012, historian Mac McAlister said that around 1905, "Georgetown reached its peak as a lumber port." As the twentieth century dawned, Georgetown under the leadership of Mayor William Doyle Morgan began to modernize. The city added electricity, telephone service, sewer facilities, rail connections, some paved streets and sidewalks, new banks, a thriving port, and a new public school for white students. Public schools were segregated and black schools were historically underfunded. The US government built a handsome combination post office and customs house. Like most cities, Georgetown suffered economic deprivation during the Great Depression. The Atlantic Coast Lumber Company went bankrupt early in the depression, putting almost everyone out of work. Businesses related to the mills also lost revenues and had to lay off employees, with a cascading effect through the city. In 1936 help arrived. In that year the Southern Kraft Division of International Paper opened a mill; by 1944 it was the largest in the world. From the mid-20th century, the city developed more industry. In 1973 the Korf company of Germany founded a steel mill in town. The steel mill was financed in 1993 by Bain Capital and was called Georgetown Steel, which became GST Steel Company with its sister Kansas City Bolt and Nut Company plant in Kansas City, Missouri. A major disaster struck the area in September 1989: Hurricane Hugo struck south of Georgetown. Its extremely hard winds and an intense storm surge along the rivers flooded and damaged Georgetown and nearby areas. As Georgetown was under Hugo's northern eyewall, it suffered winds more severe and damaging than in Charleston, which was in the hurricane's weak corridor. In recent years, the economy has become more diversified. The GST Steel Company declared bankruptcy in 2001, first closing the Kansas City plant. In 2003 it closed the South Carolina plant. The Georgetown plant has subsequently reopened under ownership of ArcelorMittal. Due to the influx of cheap foreign steel into the United States, the plant closed its doors again in August 2015. On May 19, 2017, Mayor Jack Scoville announced that ArcelorMittal had agreed to sell the mill to Liberty Steel. Heritage tourism has become a booming business in Georgetown, supporting much retail activity. In addition, many retirees have chosen to settle in this area of beaches, plantations redeveloped as residential communities, and pleasant climate. On January 18, 2018, long-time Democratic City Councilman Brendon Moses Barber, Sr. was inaugurated as Mayor of Georgetown; he is the first African-American mayor of the city. The City of Georgetown has always elected Democratic mayors, even as the make-up of the major parties has realigned since the late 20th century. During the Great Awakening of the late eighteenth century, Baptist and Methodist preachers welcomed both whites and slaves as members in congregations and some became preachers. First Baptist Church is a majority-white congregation. After emancipation, most freedmen withdrew from the Southern Baptist Church to set up independent black congregations and their own associations and conventions. There are more Baptist churches than any other denomination in the city. Georgetown has been the destination of many prominent people throughout the nearly 277 years of the city's life. George Washington visited Clifton Plantation and addressed the townspeople in 1791. President James Monroe was entertained in 1821 at Prospect Hill (now Arcadia) on Waccamaw with a red carpet rolled out to the river by which he arrived. Theodosia Burr, daughter of Aaron Burr, made her home at the Oaks Plantation (now part of Brookgreen Gardens) after her marriage to Joseph Alston in 1801; she departed from Georgetown in 1812 on a voyage that ended in her death in a storm. Brookgreen was the boyhood home of painter Washington Allston. Joel Roberts Poinsett lived at White House Plantation on the Black River. After retiring from government service, Poinsett entertained President Martin Van Buren at his home. President Grover Cleveland, as guest of the Annandale Gun Club, came for duck hunting in 1894 and 1896. Bernard Baruch, America's elder statesman, entertained many notables at Hobcaw Barony, his country home for many years. Among those were President Franklin D. Roosevelt, Winston Churchill, General Mark Clark and General Omar Bradley. Today, the Georgetown Historic District contains more than fifty homes, public buildings, and sites listed on the National Register of Historic Places. Other sites on the National Register include Annandale Plantation, Arcadia Plantation, Battery White, Belle Isle Rice Mill Chimney, Beneventum Plantation House, Black River Plantation House, Brookgreen Gardens, Chicora Wood Plantation, Fairfield Rice Mill Chimney, Friendfield Plantation, Georgetown Light, Hobcaw Barony, Hopsewee, Keithfield Plantation, Mansfield Plantation, Milldam Rice Mill and Rice Barn, Minim Island Shell Midden (38GE46), Nightingale Hall Rice Mill Chimney, Old Market Building, Pee Dee River Rice Planters Historic District, Prince George Winyah Episcopal Church, Joseph H. Rainey House, Rural Hall Plantation House, Weehaw Rice Mill Chimney, Wicklow Hall Plantation, and Winyah Indigo School. ^ a b "Geographic Identifiers: 2010 Demographic Profile Data (G001): Georgetown city, South Carolina". American Factfinder. U.S. Census Bureau. Retrieved February 8, 2017. ^ Note: Indigo production in British India soon eclipsed the production of indigo in the Carolinas, and rice took its place as the chief commodity crop. ^ The collapse of the rice economy was due to the abolition of slavery. The soft silt soil of the South Carolina low country required harvesting of the rice by hand. Slavery made the labor-intensive cultivation and harvesting profitable. The abolition of slavery and rise of free labor meant that the economics had changed. In addition, the disruption and destruction of the war delayed the resumption of agriculture. ^ "J.R. Smith Residence". www.gcdigital.org. ^ Payette, Peter. "South Carolina Forts". Retrieved 8 Mar 2016. ^ Proctor, Victoria. "Marlboro County, SC in the War Between the States". Retrieved 8 Mar 2016. ^ Thomas, J.A.W. A History of Marlboro County, South Carolina. Atlanta, 1897. Reprint sponsored by the Marlborough Historical Society; Gateway Press, Inc. Baltimore. 1989. ^ Palisin, Steve (2012-10-14). "Wooden Boat Show sails into Georgetown". The Sun News. Retrieved 2012-10-19. ^ Helling, Dave (2012-01-06). "Bain Capital tied to bankruptcy, closing of KC steel plant". KansasCity.com. Retrieved 2012-02-01. ^ David Wren. "Romney's Bain made millions as S.C. steelmaker went bankrupt". KansasCity.com. Retrieved 2012-02-01. ^ "Missouri Valley Special Collections: Item Viewer". Kchistory.org. 2001-02-08. Archived from the original on 2013-01-16. Retrieved 2012-02-01. ^ Sullivan, Andy (2012-01-06). "Special report: Romney's steel skeleton in the Bain closet". Reuters. Retrieved 2012-02-01. ^ "To the Citizens of the City of Georgetown". South Strand News. 2017-05-19. Retrieved 2017-05-25. Wikivoyage has a travel guide for Georgetown (South Carolina). Wikimedia Commons has media related to Georgetown, South Carolina. 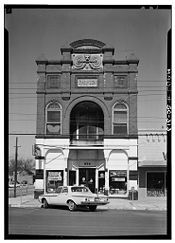 Wikisource has the text of a 1911 Encyclopædia Britannica article about Georgetown, South Carolina.